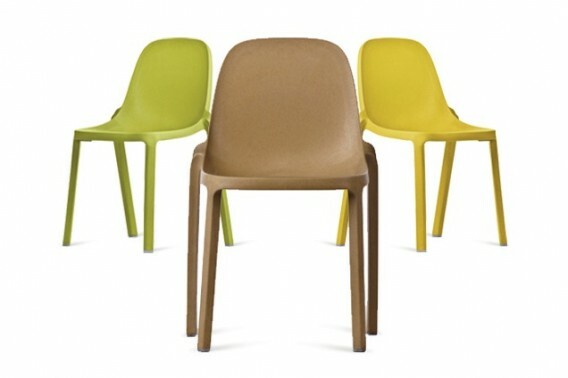 Emeco, maker of iconic chairs with 80% recycled aluminum, will soon offer the Navy Chair made with recycled Coca-Cola bottles, according to Dezeen. Representing four years of research, 111 Navy Chair will be made with 111 PET bottles, or about 65% post-consumer content. According to Emeco, not only will the chair be "super strong, durable and comfortable," but it will also be "warm, colorful and about half the price of the aluminum one." Thoughts? Available exclusively from DWR. Emeco* designs are simple, elegant, timeless, and award-winning, but did you know that their furniture is also super green? Emeco furniture is hand-made from 80% recycled aluminum — half of which is post-consumer (soft drink cans) and the other half is post-industrial (manufacturing scrap). Because of this, their furniture can contribute to LEED points in your green project (MR 4.2/5.1). The second thing that makes Emeco’s furniture so green is that their pieces are made to last for at least 150 years! In this day of disposable furniture that lasts for maybe a decade, 150 years is an impressive lifespan. Emeco’s designs come in two standard finishes, brushed and polished.